While last month's Nailbox may have been a bit of a disappointment, I had high hopes that they'd redeem themselves. Plus with the April theme being their 1 year birthday celebration box, I had pretty high expectations of the contents! While there might be some familiar faces in the box, there's a great choice of colours to choose from. 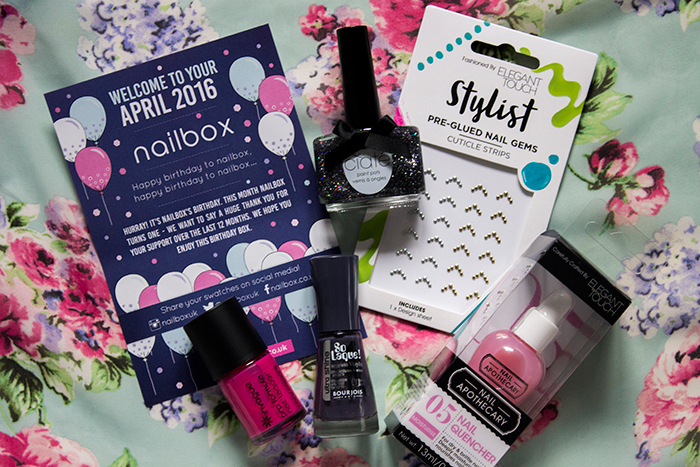 Here's what's in the April 2016 Nailbox. In this month's box we see the return of yet another Elegant Touch Nail Apothecary product. This time it's the Nail Quencher, which is said to help bring moisture back into the nails (which is needed if any of you tried the false nails from last month!). It's a product I do have use for but personally I feel that these being included in the box is starting to get a bit repetitive. A really nice base coat but nothing too exciting. I'll admit I'm a bit of a brand snob when it comes to nail polish so I wasn't all that thrilled to see the Invogue Pro Formula Nail Lacquer in Sugar Daddy in the box. Having said that, it is a lovely Summery pink shade and from the reviews I've read, it has had some favourable ones. Maybe I shouldn't judge a nail polish by it's packaging? I've been wanting to try Bourjois nail polishes for quite some time so I was really happy to see the Bourjois So Laque Ultra Shine Nail Polish in Bleu Asphalte included in this month's box. The colour is quite hard to describe but I'd say it's a purple toned navy which looks gorgeous on the nails. A colour that is definitely up my street. All birthdays need a bit of sparkle and the stand out polish of this month's box has to be the Ciate Paint Pot in London Baby. It's a grey/silver glitter mixed with multicoloured glitter which makes a really gorgeous accent nail shade. I actually teamed it up with the Bourjois shade and they compliment eachother perfectly. PS: it's actually £1.99 on Fragrance Direct at the moment!! Last from the box is the Elegant Touch Stylist Pre-Glued Nail Gems, which are basically the easy way to make your manicure look fabulous. I love nail art and all that but sometimes it gets messy and never turns out the way you want so I think these are a great addition to the box. Definitely something that I'll be experimenting with. That's it for my April 2016 Nailbox! I really enjoyed the contents of this month's box, especially compared to last month. I think that's just the way subscription boxes are, you're never going to like each and every box so I'm really glad they redeemed themselves this time around. The May box will be the last of my 3 month subscription so here's hoping it's a good one!